Like a proton, Kelly Yorke has a positive charge, driving her to go above and beyond in her field. 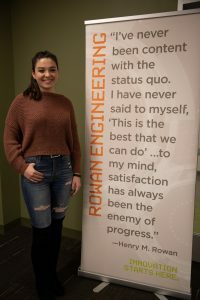 The New York state resident, a chemical engineering major, became president of the Society of Women Engineers (SWE) at Rowan as a sophomore, a remarkable feat, and continued on through her junior year. 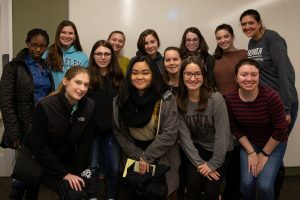 Heavily involved with the club, Kelly most recently planned the group’s trip to the National Conference in October where the young women learned about professional development, how to make advancements in the field and what it’s like being a woman pursuing STEM. In fact, Kelly emphasized that SWE’s mission statement assures that the club is open to anyone who supports women pursuing a degree in STEM. A common misconception is that the club is exclusively for women, because anyone is actually welcome to join and attend meetings and events. Kelly often brings in speakers that may appeal to the career paths of members in the club. 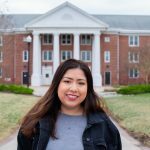 During the fall semester she secured a L’Oreal employee who spoke of her transitional journey from college to landing a full-time career at a big-time company like L’Oreal. This connection spoke to Kelly on a personal level, as she wishes to pursue a chemical engineering career in consumer goods, focusing specifically on personal care products, makeup or food. A dream job of Kelly’s would be working at P&G, on the research and development side of things. With the resume she’s created for herself so far, dreams are looking like a reality for Kelly. She applies for research and development jobs constantly, always seeking out opportunities to further grow her knowledge within the field. 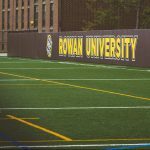 Along with a heavy classwork load, Kelly completes engineering clinics each semester, a requirement for engineering majors at Rowan. 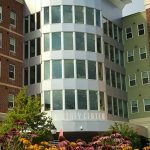 During the fall semester Kelly worked at the Sustainable Materials Research Lab at the Tech Park, continuing on a clinic project after working there over the summer. Under the direction of Dr. Joseph Stanzione and Researcher and Adjunct Professor Dr. Silvio Curia, Kelly and the team work hand in hand pairing a bio-based monomer with diacids to produce viable polyesters. They then characterize those polyesters to get a deeper understanding of their thermal properties. The overall goal of the project is to find a bio-based polyester that will serve as an alternative to PET, or the nonrenewable plastic typically used in food and beverage packing. Aside from her work in chemical engineering, Kelly gives tours at Rowan as an admissions ambassador, and plays for the club field hockey team. 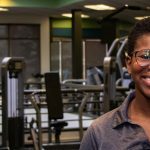 With a fully booked schedule, her future plans motivate her to get all jobs done. “I want to dip my toe in anything. I do have a plan for my future. Work in a plant for 5 years. Get my MBA, take the business side of things, then work my way up the corporate ladder,” she says, envisioning her career path ahead of her. Being involved and taking the extra steps during her college years is laying the foundation for a successful future for Kelly Yorke.